Designed specifically for the bass guitar the Boss CEB-3 Bass Chorus Pedal brings you the rich, shimmering effect of a choir of voices that are perfectly in tune with each other. This it does by taking your sound and mixing it with delayed and pitch-modified version of itself and giving you masses of sustain while it’s at it. Being purpose-built for bass guitars the Boss CEB3 Bass Chorus Pedal leaves the fundamental bass notes of your instrument uncoloured and concentrates on the upper range. The amount of the range that the effect is applied to is governed by the Low Filter control knob, for example you can set it to affect just your basses treble, to give a transparent feeling when playing slap. The Boss CEB-3 Bass Chorus Effect Pedal also gives you stereo outputs for you to hook the pedal up to two amps. Outputted to two amps your sound will have extra fullness and depth that gives it a spatial effect. 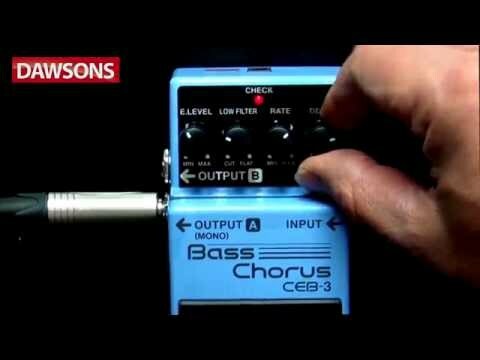 Light and compact the Boss CEB-3 Bass Chorus Effects Pedal is ultra-portable. Ensuring continued functionality through the years and surviving the knocks of a life on the road the pedal has been designed with a robust housing and sturdy control knobs. Ever confident about the lastability of their products (and with good reason) Boss offers a 5-year warranty on the Boss Bass Chorus CEB-3 Pedal when you register it with them.